“Working by calculation, engineers employ geometrical forms, satisfying our eyes by their geometry…their work is on the direct line of good art,” Le Corbusier described the engineer’s aesthetic. This kind of engineering expressionism is employed to interesting ends by Ennead Architects at the Engineering Education and Research Center (EERC) at the University of Texas at Austin’s Cockrell School of Engineering. The building features a dramatic glass-enclosed atrium that connects disciplines on a monumental staircase and provides sightlines into working laboratories, arranged like a page of comic book panels. 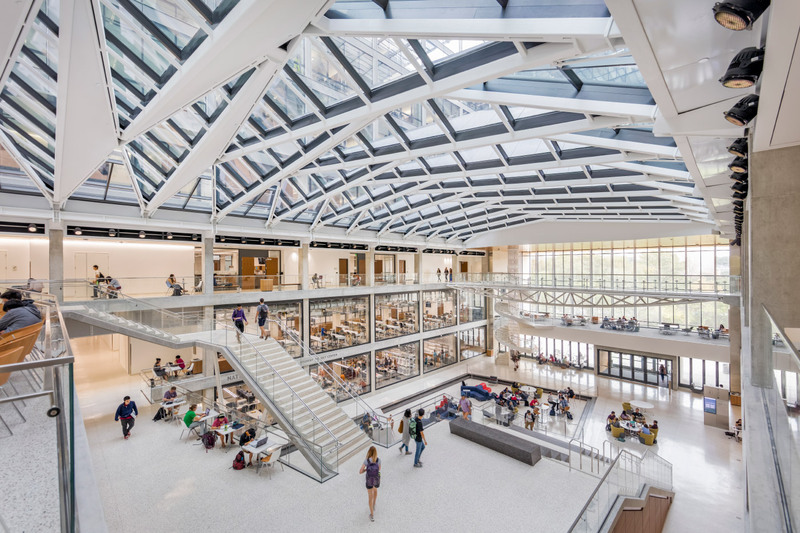 A glass ceiling spans the 80-foot-wide space, and two towers on either side contain multidisciplinary research labs and electrical and computer engineering research spaces, respectively. The unification of disciplines in the atrium is expressed through a series of expressive parts: A truss-like bridge, a bespoke waterjet-cut spiral staircase, and slanted columns below the mezzanine level all show off the aesthetic of an engineer rather than one seamless whole. This honesty is a direct appeal to the students and engineering community who will inevitably congregate in the atrium. 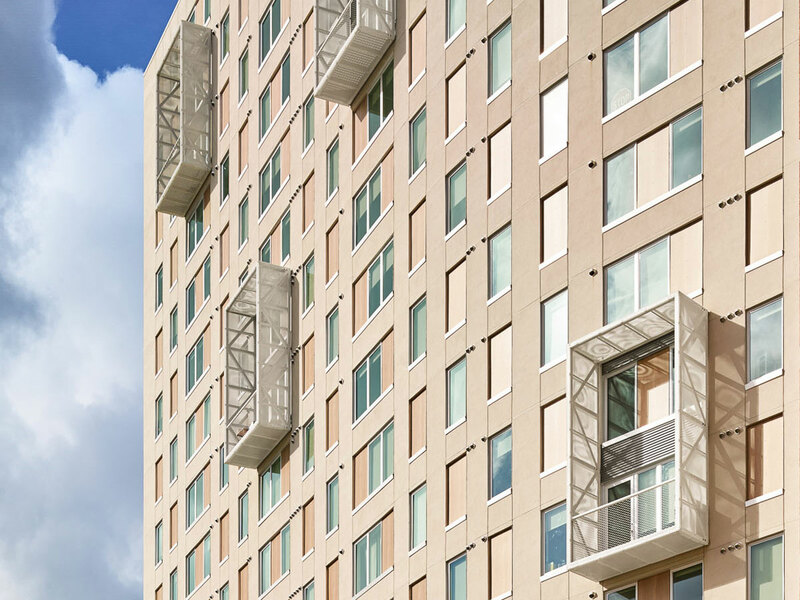 Rhode Partners, an interdisciplinary design studio that unites architecture, interior design, and master planning, has recently completed a student housing project situated just outside the campus of the University of Texas at Austin. A soft curvature along the exterior envelope of the tower organizes the residential portion of the building along an asymmetrical linear grid, while custom-designed clothespin-shaped columns help transfer the load of the tower structure down into a parking garage below. The design of the project was inspired by "avoiding stereotypes" of what typical apartment housing looks like, according to Brett Rhode, director of Rhode Partners. "We wanted to avoid the common L-shaped building scenario, so we developed a way to make a prominent widening of the footprint that gave us some interesting form to work with architecturally and also provided a way to increase the rentable square footage." 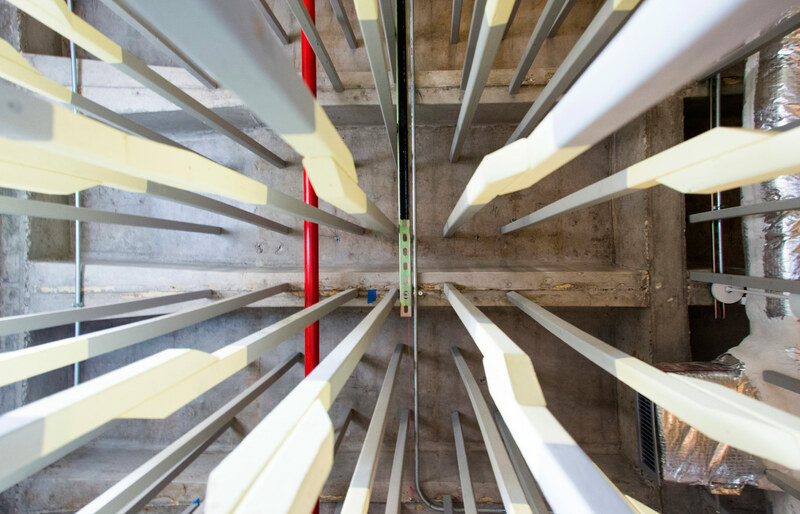 The building envelope of the residential tower is constructed of light gauge non-load bearing metal framing with two cladding systems that respond to different areas of the building. The first is a rain screen system with a layer of mineral wool exterior insulation. Rainscreen materials vary from metal cladding to fiber cement and high-density laminate cladding. The other exterior cladding assembly was an exterior insulation and finish system (EIFS), which is employed in the curved sections of the primary facade. Below the tower sits a three-story parking garage podium that was clad with expanded aluminum sheet panels; these offer visual screening to parked cars. The panels are attached to horizontal tensioned cables, eliminating the need for a backup steel framework. This detailing, along with the modular panel size, offered an economical solution to the garage facade. One of the most recognizable elements in the building design is several projecting balcony elements that responded to the client’s program requirements of providing a select number of balconies for the building. The architects wrapped a cantilevered steel frame in perforated metal panels and used fiberglass gratings for flooring, treating the balconies as translucent figural shapes that project beyond the facade. Rhode said, "it seemed like an interesting opportunity to use them to enliven the facade. We turned them into objects that don’t immediately look like balconies.” A core focus of the Austin-based architecture firm is to integrate BIM and IES energy modeling on all of their projects, which span civic, multifamily, hotel, office, and retail markets. The project team for University House Austin was able to collaborate with the general contractor (Rogers O’Brian Construction) to develop an initial BIM model that was referenced throughout the construction of the project. “This was a big reason why we were able to get a more interesting facade within budget, “ said Rhode. “We also use digital fabrication techniques in our model shop, especially in the early design phases.” Rhode will be participating in Austin's upcoming Facades+AM conference, where he will be joining other local architects, engineers, and planners in a session titled “Austin’s Changing Skyline.” He will be focusing on the technological aspects of the envelope of one of their latest projects—The Independent—as they relate to aesthetics, energy usage, and cost. The event is part of a multi-city conference series on high-performance building enclosures. More information on Facades+AM, which organizes ten presenters into a three-session morning breakfast and networking event, can be found here. 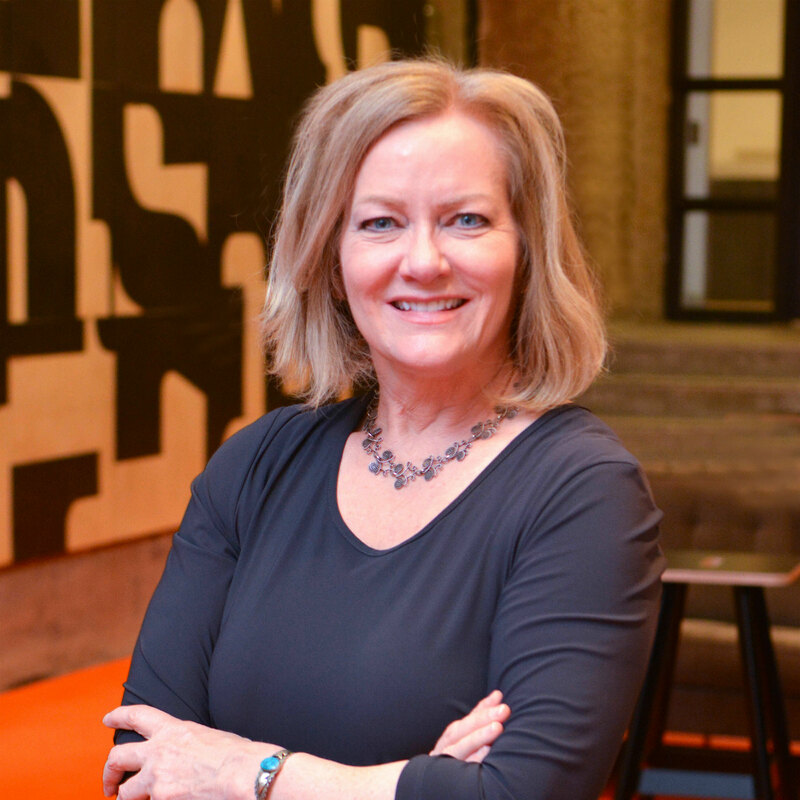 This summer the University of Texas at Austin School of Architecture (UTSoA) will be the latest school in recent years to appoint new leadership, welcoming Professor Michelle Addington of Yale University as its new dean. Addington will succeed Interim Dean Elizabeth Danze, who took the helm of the institution last year after the abrupt departure of Frederick Steiner. 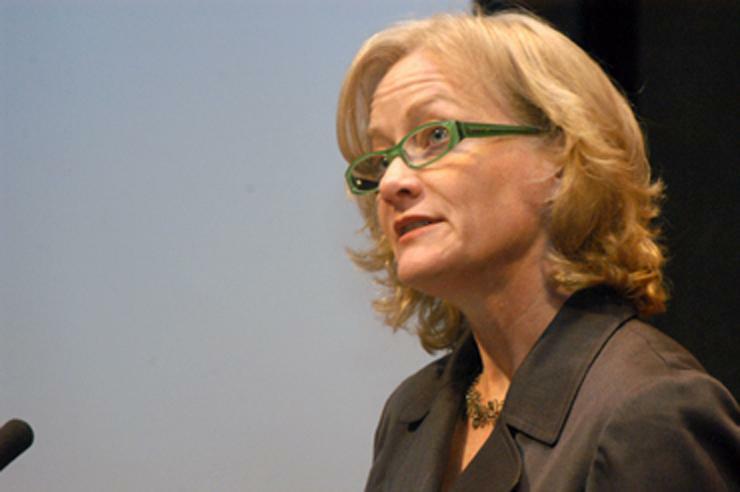 According to Maurie McInnis, the executive vice president and provost at UT Austin, “Michelle is a perfect fit.” She added that Professor Addington “brings fresh eyes and new ideas that will continue supporting the robust breadth and depth of interdisciplinary work happening at the school, and she will lead conversations that advance the field in the 21st century." The Architect’s Newspaper (AN) spoke with Addington last week about her vision for UTSoA, emerging issues for designers in the built environment, and her eagerness to be walking distance from Franklin’s Barbecue. AN: What initially interested you about UTSoA as an institution? Michelle Addington: I wanted this position for a very long time. I always kept my eye on different deanships and interviewed off and on over the years, but none of them felt right to me. When this became available, I knew it was one I really wanted. Part of it has to do with the fact that I come from a Texas family and there is a sense of home. My mother is from Austin, so it is a part of the country that really resonates with me. Another part of it has to do with the fact that [UTSoA] has such a storied legacy in the development of contemporary design education. One can look to the Texas Rangers... [they] were an incredibly formative part of architectural education. And, the fact that the full range of design disciplines are represented, everything from architecture, interior design, landscape architecture, urban design, community and regional planning, sustainable design, and historic preservation. And a robust combination of degrees from undergraduate to PhD. I feel that it's a place that is right for me as an individual but also a place where I feel as though I can bring my experience to the existing faculty and students and build on their strengths. In the last few years, the school has attracted significant funding and progressive initiatives. Examples include the U.S. DOT Transit Research Grant, a new faculty position for the study of Race and Gender, and a high-tech Robotics Lab, to name a few. Though these are early days, can you talk a little about these initiatives and the direction you see the school going under your leadership? If you think about the field of architecture writ large—about all of the design disciplines—they were heavily product-centric for centuries. The digital turn at the end of the 20th century brought forward methods that enable us to deal with multiple contexts, multiple terrains, and different kinds of content. We became incredible masters at manipulating this varied terrain but mostly in terms of dealing with what I consider to be ‘contested boundaries.’ It’s easy to think about a building as being bounded by its site and envelope. But when you start to look at [architecture] as an insertion for instance in ecological, economic, spatial, political boundaries, [it] can accurately map and open up questions that I don't think any other discipline can do. All of these initiatives—the DOT, the Robotics Lab, the program dealing with gender and racial diversity—are looking to insert [designers] into the center of questions that heretofore have been addressed by other disciplines. I think the University of Texas has been on the mark in recognizing what we need to do [in this respect] and it is one of the reasons I'm so excited to be there. One of the things that I spoke to the [UTSoA] faculty about was that I see interdisciplinarity differently than I think many traditional schools of architecture have seen it. All too often we think about how we fold in content from other disciplines—that is not interdisciplinarity to me. That's cherry picking information to support what it is one wants to do. Real interdisciplinarity actually means that you have to be involved in, understand, and affect the 'other'—other frameworks and conflicting points of view. And, you have to de-center yourself in order to do that. You are making some news as the first woman to be named dean of UTSoA, succeeding Elizabeth Danze as Interim Dean. Your credentials I think speak for themselves but do you perhaps have any thoughts about the increasing prominence of women in leadership positions at architecture schools? And in the profession? 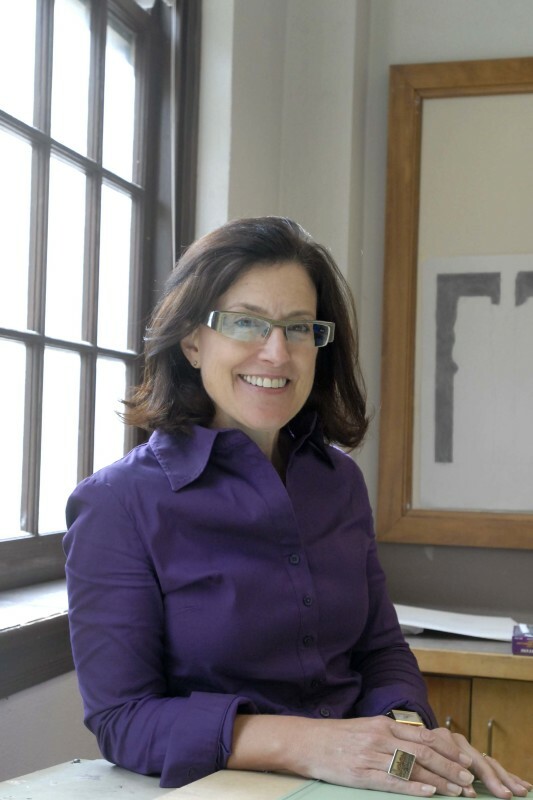 I have to correct that because Elizabeth Danze is the first woman dean [of UTSoA]. She may be interim but she is the trailblazer here. She is one of my favorite people. There are many ways that practice leads academia in terms of its reflection of the world at large. However, this is a case where practice is lagging. It's going to take some time. I think one of the things that would be interesting to talk about with a larger number of women in the field... is this idea of the ‘other.’ [Women] are used to being on the margins, away from the center, practicing on the edges. A number of years ago there was a book put together by Lance Hosey and Kira Gould called Women in Green: Voices of Sustainable Design. They had noticed there was a disproportionate number of women who were working in sustainable design. You are going to find this for a lot of interdisciplinary areas that are on the edge. I think that as we start looking, again, at this negotiated terrain that is not so centered on the building object, we are going to find and recognize a lot more parity from a gender standpoint. There might be some pendulum swinging for a while because we have big problems to deal with in this world. All I can wait for is the day when it doesn't even occur to someone to say ‘woman architect’ but simply ‘architect.’ I want that term to disappear from our [discourse]. As a public institution, UT Austin operates quite differently than a private school like Yale, where you currently teach. Recently, we have seen several controversial policies emerge in Texas such as Senate Bill 6 (the so-called “bathroom bill”) and the open carry law which went into effect last summer. With these in mind, how do you see architecture schools engaging with similar issues of public space and more broadly how does this translate into practice? I can't say yet how it translates into practice. But what I can say is these issues are another reason why I want to be at [UTSoA]. I want to come precisely because these debates are on the table. It is very easy to be critical of how others are thinking about particular situations, but part of understanding and embracing the 'other' is that you have to fully embrace it. You have to engage yourself in that discourse no matter what you believe for yourself. We are in a really messy world. We are not going to be able to come up with solutions by bracketing ourselves and narrowing our domains or territories so that we are only surrounded with like-minded individuals. I am most interested in figuring out how we negotiate these radically different voices. How we map progress that accepts these differences yet at the same time protects the most vulnerable. In design disciplines, we have an enormous responsibility for the health, safety, and welfare of society at large which means we have to tackle these issues head on. What we really need to do is figure out how to engage. On a lighter note, you will begin your post on July 1st of this year; and, as you well-know having attended Tulane, the south has an unforgiving summer heat. Weather aside, though, what are you looking forward to most about relocating to Austin? Well, my grandparents lived outside of Dallas and I used to spend my summers at their unairconditioned ranch. I've never forgotten that. Number one, though, is BBQ. No matter what you try in the north nobody can make decent BBQ and I'm tired of my friends from New England constantly dragging me to places where they claim that it's the best BBQ—no. And driving, I shouldn't say this because I'm a sustainability person, but I miss a good road trip. I've never been to Marfa, that's so high on my list. 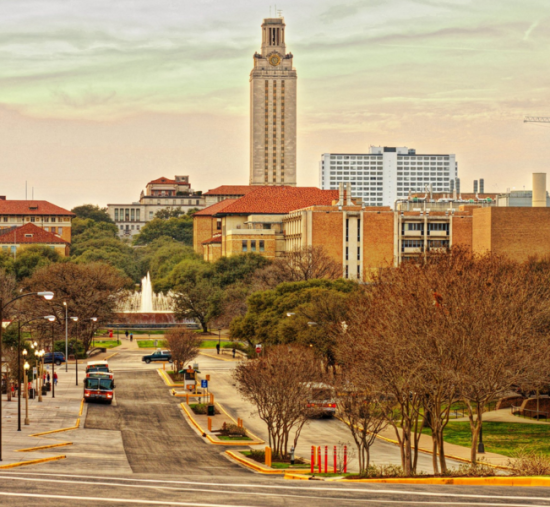 The United States Department of Transportation (DOT) is pouring money into transit research at universities nationwide, among them the University of Texas at Austin School of Architecture (UTSOA). 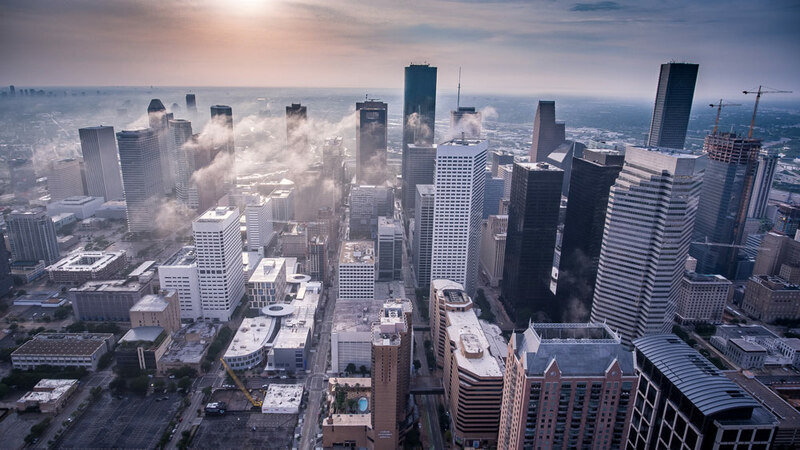 The federal agency is giving millions in grant money to UTSOA and its partner schools to fund transit research in so-called megaregions, rural-to-urban geographic areas that share environmental features, infrastructure, and economic futures. The funds will be disbursed over five years, beginning with a $1.4 million grant for UTSOA's 2016-17 fiscal year. Dr. Ming Zhang, associate professor of community and regional planning at the School of Architecture and researcher at the university's Center for Transportation Research will lead the four-school "CM-2" consortium (CM-2 stands for Cooperative Mobility for Competitive Megaregions). The group includes researchers from Louisiana State University, Texas Southern University, and the University of Pennsylvania. “Support from the U.S. Department of Transportation will allow us to advance our research, education, and technology transfer initiatives that work to improve the mobility of people and goods in urban and rural communities of megaregions like the Texas Triangle,” said Dr. Zhang, in a statement. “CM-2 seeks innovations in institutional cooperation for transportation planning, multi-modal integration for increased access and equity, and better transportation investment decisions and public engagement achieved through improved information technologies.” UTSOA's DOT grant is one of 32 from the agency that fund research at University Transportation Centers (UTC) programs. UTC works with transportation agencies and the private sector to study the field from all angles. CM-2 will lead workforce development and education, carry out mobility research, as well as investigate how technology could be used to enhance mobility and economic vitality in megaregions across the United States. The group's research will focus on transportation policy and regional planning, increasing equitable connections across regions, thinking about modeling for fast-growing regions, and coming up with new multi-modal planning strategies. 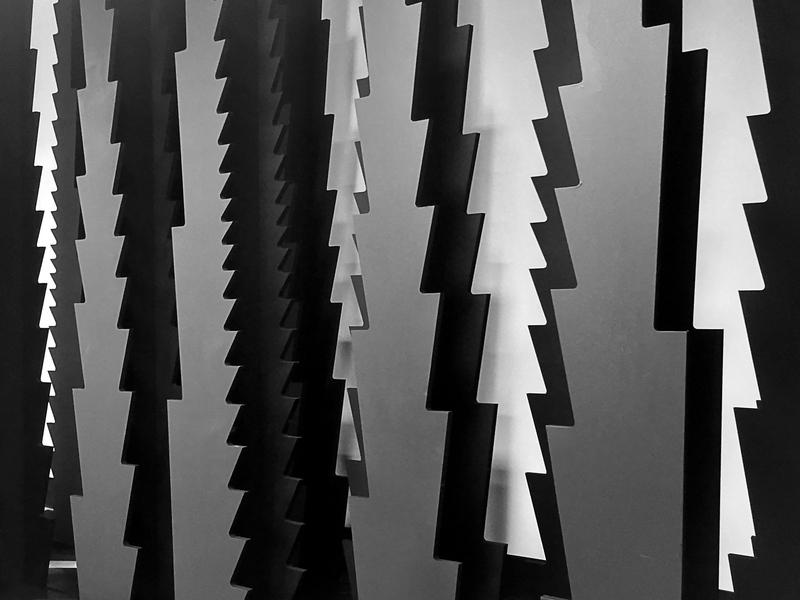 Together, Siddiqui and Feliz explored issues of serial variation, digitally derived patterning, and robotic painting. The result was Serriform. Drawing on Ettore Sottsass’s 1992 Adesso Peró bookcase, Serriform gets its name from the serrated edges of its columns. The University of Texas at Austin is the first tier-one public university in the United States to build a new medical school from the ground up in almost 50 years. Dell Medical School, funded largely by a raise in local property taxes, consists of 11 departments and institutes scattered among new buildings on the southern edge of campus and oriented around the school’s idyllic Waller Creek. The new campus’s master plan, designed to connect the medical district physically and architecturally to the rest of the university and Downtown Austin, was designed by Sasaki Associates and Page Southerland Page. Of its new structures, unquestionably the centerpiece is Page’s and S/L/A/M Collaborative’s Health Learning Building. The five-story structure is a long, slender volume with massing, height, and materiality all informed by the campus’s materials, colors, and overall feel. It’s essentially divided into two main components: The north-facing “social edge”—a section of open spaces, workshops, and breakout zones expressed by a largely glass wall (including both clear- and clay-colored glass)—and a large, multilevel cantilevered stair. An opaquely-clad section, facing south, east, and west, is marked by intricately CNC-milled limestone walls with punched windows (shaded by terra-cotta colored fins). All areas feature team-based learning spaces and labs, as opposed to traditional classrooms, a strategy meant to promote innovation and collaboration. “They’re really interested in being revolutionary. Rethinking the healthcare industry,” said Page partner Lawrence Speck. The school’s tagline, he noted, is Rethink Everything. The surrounding structures, which Speck refers to as “fabric buildings,” are tied together, and to the rest of campus, by materials like stone and metal as well as by their height and massing. 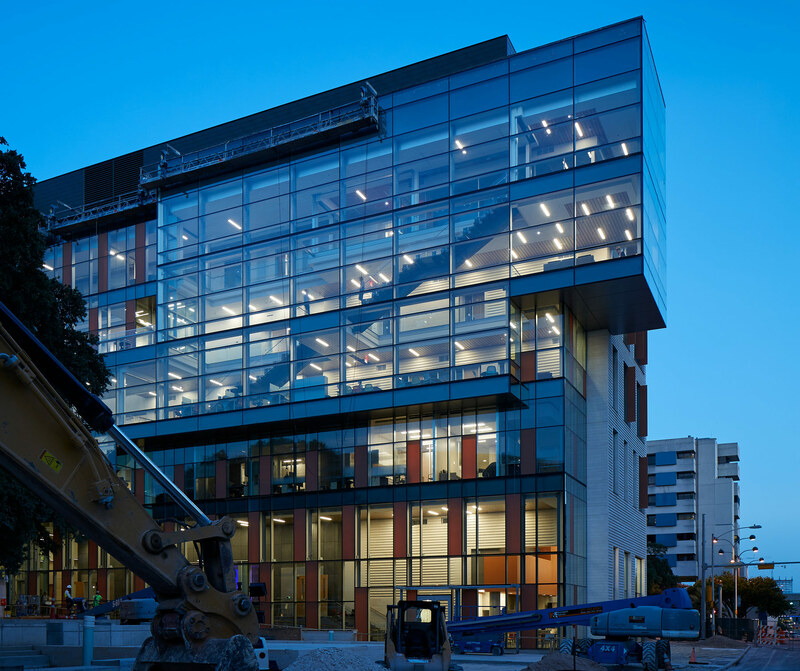 The 260,000-square-foot, eight-story Health Discovery Building is primarily for research and houses 97,000 square feet of laboratory space, a 20,000-square-foot vivarium and 15,000 square feet of core labs. The 233,000-square-foot, 10-story Health Transformation Building, an advanced medical office building, will be connected to the Health Discovery Building via a five-level “dry lab,” allowing collaboration among medical professionals and clinical researchers. 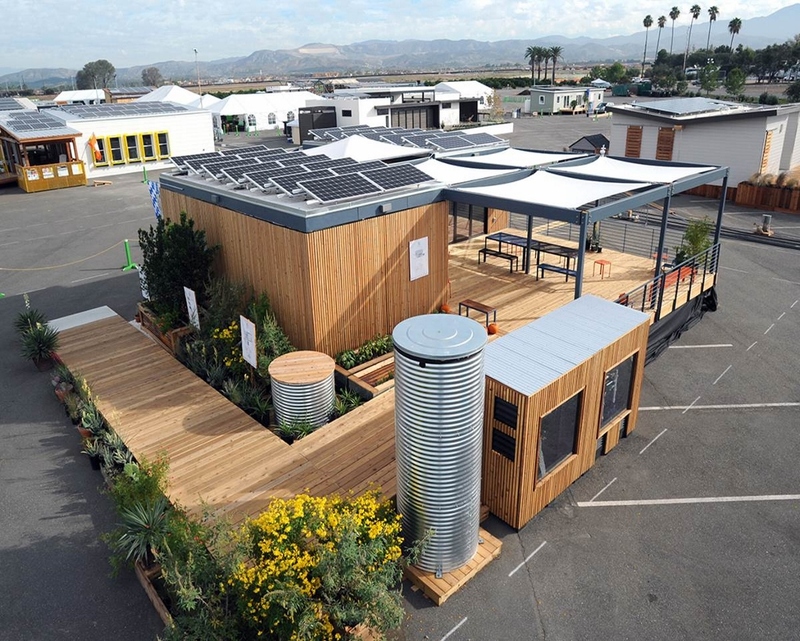 The campus is also shooting high in terms of sustainability. The Health Learning Building will be LEED Gold, while the overall district is aiming to be one of the first examples of the Sustainable Sites Initiative, evaluating buildings, landscape architecture, and engineering as a holistic whole. Things seem to be going so well, said Speck, that the dean has already started talking to the design team about a second phase of building, far ahead of schedule. “They definitely see the architecture as a means to go after their goals,” said Speck, who has been studying, teaching, and building at UT for about 40 years. “I feel like I’m living a dream,” he added. When Professor Michael Garrison, the Cass Gilbert Centennial Teaching Fellow in Architecture at the University of Texas at Austin, thinks about how students are pushing the cutting edge in design, three developments come to mind. First, said Garrison, who will participate in the “Form Follows Performance” panel at the upcoming Facades+Dallas conference, is a heightened attention to materiality. “Our students are keen on new materials, the embodied energy of materials, smart materials,” he explained. This new awareness is largely the result of students’ exposure to the school’s University Co-op Materials Lab, a multidisciplinary space for hands-on exposure to more than 27,000 materials samples. Second is the question of craft. “We find it very interesting that naval architects and NASA call their works craft, but we in architecture don’t know such things,” said Garrison, recalling Buckminster Fuller’s question, “How much does your house weigh?” Thanks to developments in digital design and fabrication, he said, “the old idea of tool and die mass production characteristic of modern thinking in the twentieth century has really changed. Students are able to make something of a more unusual shape.” Parametric design is the new normal in the design-school classroom. Finally, Garrison points to a “new and profound” evolution away from “the hermetically sealed box of the Seagram Building era” to a focus on “thick skins.” These multi-layered facades typically involve a sunshade or other external component, which “creates an interstitial space between the traditional envelope and the new envelope,” said Garrison. 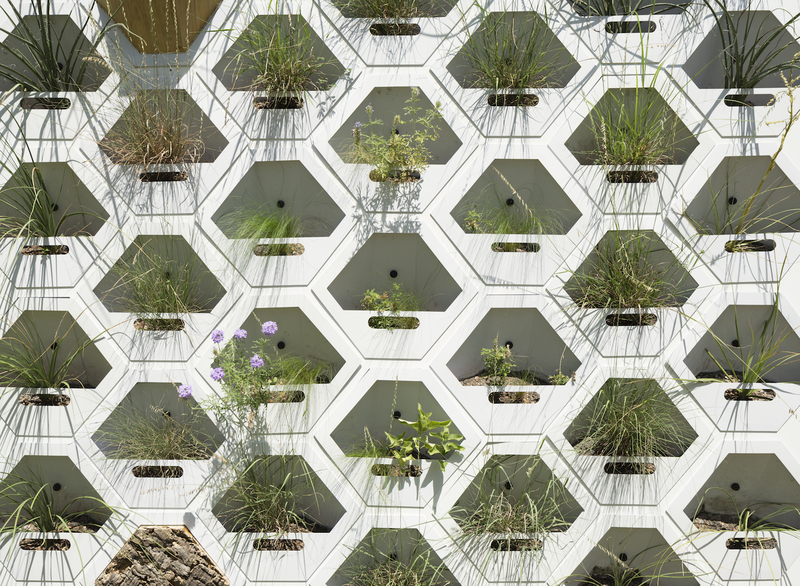 Increasingly, students are focused on incorporating adaptive technology into building envelopes, often patterning facades along biomimetic lines. “Whereas the first two decades of the twenty-first century were about unusual shapes, [with] parametric design, we are now moving toward intelligent shapes that are more responsive,” he concluded. Catch up with Garrison and other top AEC industry professionals at Facades+Dallas. Seating is limited; register today. In Hyperstyle, architects Mason Leland Moore and Joel Nolan of spaceCAMP create an environment in which physical tension takes center stage. The exhibition looks at the pull between the concrete floor and the ceiling of the Materials Lab at the school of architecture. Both set out to test different materials while exploring spatial concepts at specific site installations. Two grids of thin columns overlap with one rising from the floor, and the other descending from the roof. The tension is accentuated by the consistent overlays, along with a change in color from yellow to a light gray. Conventional construction techniques are reflected in the room’s organization through the intimate relationship formed between the ceiling and the floor’s multiple columns. Hyperstyle is on view at the Materials Lab Gallery of the West Mall Building at the The University of Texas at Austin's School of Architectures, April 15–August 10.